I have just taken part in a live Turnitin webcast, Grade Anywhere: Turnitin for iPad (free but you need to register your email address; you’ll then be sent a link to the webcast). The webcast is meant to promote their new iPad app, and it seems it is true, now you can grade (almost?) anywhere. You don’t even need a live internet connection, as long as you synced your iPad to your Turnitin account and downloaded student work before you went offline. A pity then that Turnitin itself is flawed. During the webcast, we are presented with a student essay on an event which took place in 1980*, and shown how easy it is to annotate, strikethrough text, make comments, and more. The narrator showed us how to add a bubble comment, “Nice photo,” to the photo in the essay. And, as it’s Turnitin, we also get an Originality Check. “Nice photo”? Surely the student submitting this less-than-original essay had not been around to take the photograph himself? But there is no citation. “Nice photo” it might be, but it is not the student’s. Surely? But hey, the Originality Check found no matches for the second paragraph. A pity. It’s been copied. It has been copied from an article in the New York Times Learning Network, U.S.A. Beats Soviet Union in ‘Miracle on Ice.’ In fact, the whole screen, maybe the whole essay (we are shown only these opening paragraphs so we cannot say), is copied from this ONE source. Including the typo, “United Sates.” The photo too. Technology (or is it just Turnitin?). Don’t stop thinking! This entry was posted in Academic honesty, Critical thinking, Turnitin.com by John Royce. Bookmark the permalink. I am a trainer and consultant. I work with teachers, librarians, and with students. I am a teacher-librarian, an information specialist; before going freelance, I worked in national and international schools in Zambia, England, Malawi, Germany and Turkey. 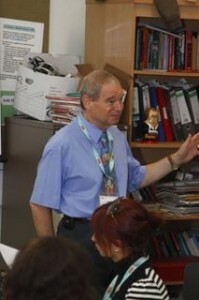 I have led IB DP workshops in extended essay and academic honesty, and DP and MYP workshops for librarians. And more! This blog features my thoughts and musings. Find out more about me in the other pages on this site.